It’s been five, or maybe even 50 years since your wedding day, surrounded by your closest family and friends. Now, you’re thinking about celebrating all the years you’ve spent together, but how could you possibly top your big day from the first time around? Go big or go home! Renew your vows in Alaska, home to some of the most scenic and romantic destinations you’ll ever visit. Here’s a look at some romantic places you can renew your vows in the Last Frontier. Many people travel to Alaska to glimpse its ice-blue glaciers. About a two-hour drive from Anchorage, you’ll find yourself surrounded by stunning glacier views fit for a bride and groom. Matanuska Glacier is perfect for those who seek accessible adventures. Just a short, easy walk will get you to the main attraction of glacier blues and crystal-like waters. There’s nothing more romantic than a waterfall kiss. Alaska has a good handful of them that are sure to sweep you off your feet. One worth mentioning is the Virgin Creek waterfall in Girdwood. This majestic setting of mossy rocks with water cascading through is located in an Alaska temperate rainforest. Just a short walk from the road, the waterfall is easy to get to and offers enough privacy for a truly special moment. Make a trip to Fairbanks for a dazzling vow renewal under the aurora borealis. As you reaffirm your commitment together, you’ll not only have the stars above but the northern lights dancing along with your heartbeats. You could shout your love from the rooftops, or you could shout it from the mountaintops. Alaska has a number of mountain ranges and peaks to choose from. For the ultimate thrill-seeking couple, schedule a helicopter ride to a remote and scenic peak – just you and the love of your life. The elevation won’t be the only thing to take your breath away. We may be biased but we think Princess Lodges each offer their own unique vow renewal opportunity. 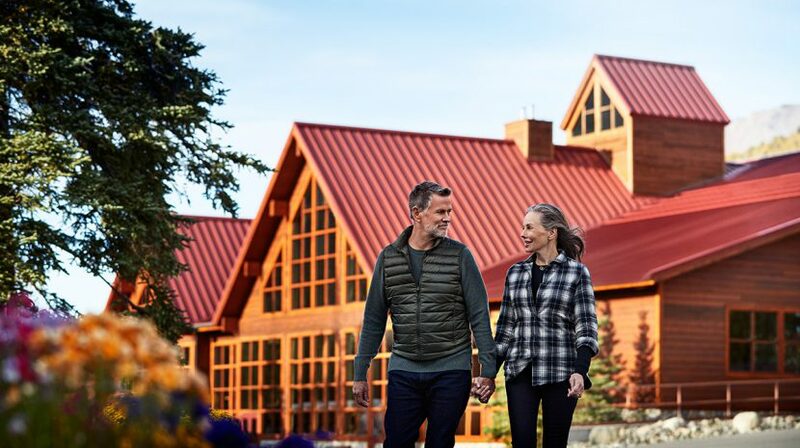 Renew your vows perched over the majestic Kenai River at Kenai Princess Wilderness Lodge or on the banks of the Chena River at Fairbanks Princess Wilderness Lodge. Or, head to the mountains. Exchange vows from the deck of Mt. McKinley Princess Wilderness Lodge’s custom treehouse or at the edge of Denali National Park and Preserve at Denali Princess Wilderness Lodge. From Copper River Princess Wilderness Lodge, take off on a glacier cruise to renew your vows on the water. The options are endless!